Do you have the urge to shop? Do you shop so much that you are broke? 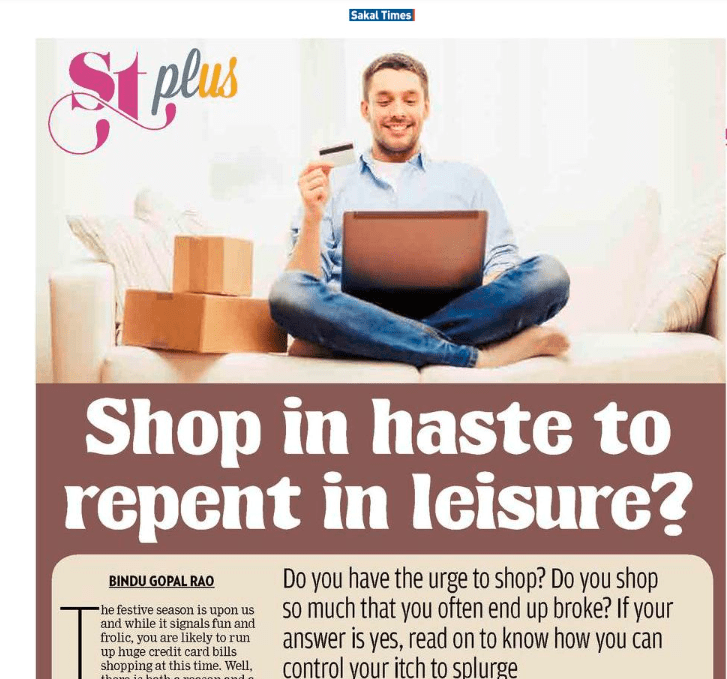 Well if you answered yes to either read on to know how you can control your craving for shopping. The festive season is upon us and while the fun and frolic continues through the same, you are likely to run up huge credit card bills shopping at this time. Well, there is both a reason and a season to shop for, and while some of us may not need either to shop, the truth is that the attractive offers may leave you broke. Take the case of 25 year old Reshma Kumar from Chennai, a media professional. A compulsive shopper, she ran up a bill of close to 50K on her credit card by shopping online. “The offers were so enticing; I just could not stop myself. I kept going from one thing to the other without realizing what I was doing. And while I had fun going through the process, my heart sank when I saw my credit card bill.” Her story is exactly what most of us will relate to. Shop in haste and repent in leisure. And when you need to make payments for the same, it does take a beating on your finances and monthly budgets are likely to go haywire. And when you are shopping with a credit card, you are likely to be lured into a debt trap as there is an option of paying a minimum amount only. While this may seem attractive, it is not something you must do, as you will be carrying a burden of debt over time that you will notice just accumulates. The other issue with shopping without limits is that you tend to have a problem of plenty. This means that storage becomes an issue and more often than not you do not wear or use what you have bought. Again, never buy something especially clothes in a smaller size assuming that you will fit into them one day. The clutter that all this accumulates will give you more stress than actually paying the bill! So what do you do to ensure that you don’t go broke while you shop this festive season? Well, here are some tips that will come handy. While this may seem like a no brainer, it is often skipped. Listing out what you need is key and often it can be like a guide that will come in handy. While making this list ensure that you keep the focus on quality, value for money and what looks good on you and for your home. If you already have something at home, repurpose it before going for something new. The most important thing is to set aside a clear amount of how much you can spend without causing a dent in your finances. For each item on your list, allocate a specific amount of money that you are willing to spend. This will ensure that you do not over spend and keep a small leeway (say about 10 percent) overall so that you will be in control of what you need. How many times have you bought something only to not use it later because it was not as appealing as you first imagined? Probably you have – many times. Today however, there is an alternative. The ecommerce boom has ensured that you can actually rent and return after using. So whether it is clothes, jewellery, bags, accessories or even furniture, everything can be rented. This means that you invest a fraction of the original cost and yet are looking how you want to! While you shop, ensure that you compare and buy. If you are doing this online there are several websites that can help you scan several pages and show you which site is offering the best price. This is what I did when I bought my camera and I saved a cool Rs. 3000 compared to where I was buying it originally. Likewise, it is important to understand that a brand name does not always ensure great quality. Use your discretion and make your purchase and you will see that you can save your hard earned money and make it work for you too!